One of the main objectives when we started planning this trip away with our friends, was to do the Gentle Annie Road. We altered some of our original ideas and routes to make sure we made it to the Great War Exhibition in Wellington before it closed, but travelling the cross country Napier-Taihape Road was always a must. The Gentle Annie seems to have got it’s nickname from the hilly descent from the Central Plateau down into the Kaweka Forest. The distance from Taihape to Napier is 152 kilometres. We are travelling east to west in the opposite direction from Napier to Taihape. A striking feature at this time of the year is the yellow flowering wild broom everywhere. The surface is tarsealed all the way now, though until a few years ago there were stretches of unsealed road. It’s a spectacular drive, and rates in the top ten incredible road trips in New Zealand. Some of the bends are tight, and there are plenty of steep grades, up and down, but our vehicles handled it well and our drivers were up to the challenge. We stopped for a lunch break along the way, when we found a safe place to pull off the road and let things cool down a bit, while we had a cuppa. Reading about the history of this road, I learned that until 1925 it wasn’t much more than a dirt track. The route was essential as a means for farmers to transport meat and wool to the port at Napier. Crossing the Rangitikei River was tricky with a horse and wagon, and a bridge was needed. The Rangitikei River originates in the Central Plateau near Taupo, in the Kaimanawa Ranges, and flows south through Taihape, Hunterville, Marton, and Bulls in the Manawatu-Whanganui district to flow out into the Tasman Sea at Tangimoana, forty kilometres south east of Whanganui and north of Himitangi Beach. At 185 kilometres long it is New Zealand’s sixth longest river. A rough winding track between Hastings and the Rangitikei River had existed since 1885, and the first car drove through and forded the river enroute from Hastings to Taihape in 1908. Then a footbridge was built in the early 1900s, but a reliable vehicle crossing was needed, and the need became more urgent after WW1 as more land in remote areas was opened up for farming. In 1923 a one way suspension bridge began construction at Erehwon, near Springvale Station, and was completed in 1925. It became known as the Springvale Suspension Bridge. The bridge got a lot of use over the next forty five years and in the 1960s it was deemed unsuitable for heavy traffic use. In 1970 the road was realigned and a new one way bridge built alongside. There are very few suspension bridges of this type left. The engineering of the early 20th century has to be admired and it’s good to see this being preserved. 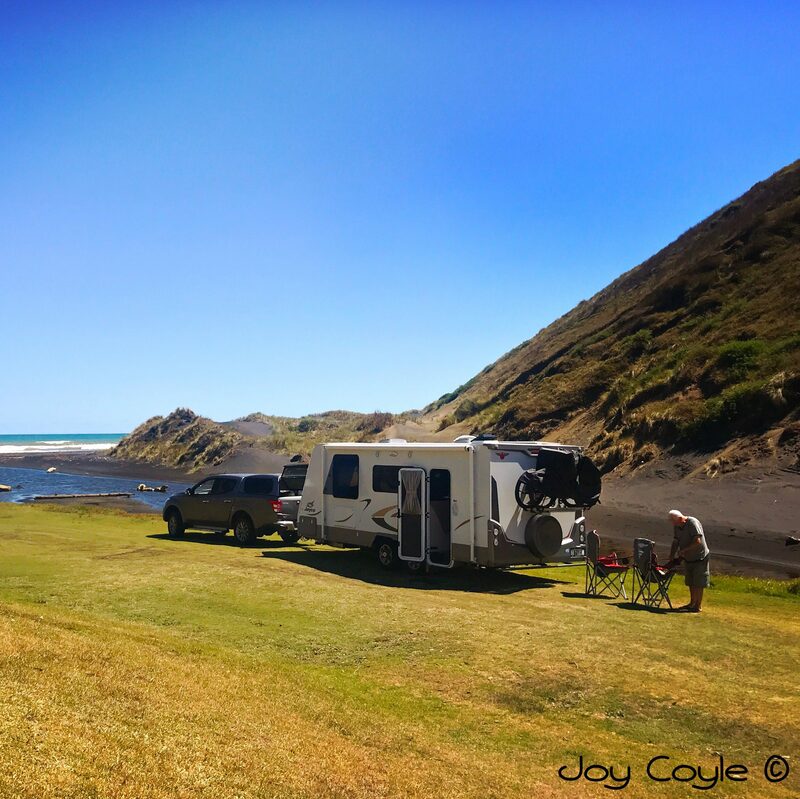 Freedom camping is allowed here at the Springvale Suspension Bridge for self-contained vehicles (#3749 NZMCA). There is a long-drop onsite (pit toilet), which I didn’t venture into. There is no cell phone or wifi coverage but we felt quite safe. There were two other vehicles overnighting here as well. The road is very quiet at night. Leaving to travel the last forty one kilometres of the Gentle Annie Road, to join State Highway 1 and the last leg of our trip, the countryside becomes farmland again as we pass by huge sheep stations and signs of community. The steep and winding roads give way to gentler country roads. But before this we come across a lone cyclist, and wonder if she is planning to go all the way to Napier. We rejoin SH1 and before long come to Waiouru and the Desert Road. … to end a wonderful two weeks with our friends Lynda and Terry. Cheers guys! It’s been a great trip. Thanks for posting your trip. You have energized my wife and me to do the same. Cheers. Great to here you enjoyed the journey through the Gentle Annie,as a motor cyclist its one of my favorite trips but so love it in my motor home as I get to linger longer.You saw it at a lovely time of year but it looks stunning also covered in snow.Enjoyed your write up and photos. Thank you so much Lorraine. So that’s ‘The Gentle Annie’ that I’ve heard about. Thanks for enlightening me, now it’s a must do. Enjoyed the blog and photos, thanks again. Thanks. I’m glad it has inspired you. Certainly a fascinating road. Pleased you got to do it and looks like you had a fun time with Lynda and Terry. We’d do it again. Thanks Jan. It’s was great!